who is beginning his sophomore year at Stanford. Zac began taking IMACS classes in first grade. Nine years later, he had completed all of IMACS Mathematics Enrichment and Computer Enrichment and IMACS University-Level Computer Science. Zac graduated valedictorian of St. Thomas Aquinas High School, but not before being founder and captain of the Robotics Club and the Programming Team, earning the rank of Eagle Scout, and being named a National Merit Scholar Finalist and National AP Scholar. Having scored 2350 on the SAT, 800 on the SAT Math II Subject Test and 5’s on the AP Calculus AB, AP Computer Science, AP Calculus BC, and AP Statistics exams, Zac was accepted at Stanford, Cornell, UC Berkeley, Georgia Tech, Rice, and RPI. He chose Stanford where he plans to major in computer science. 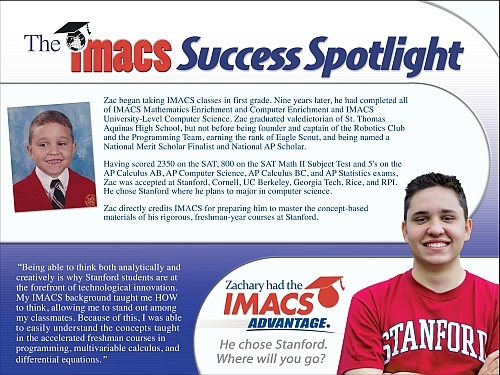 Zac directly credits IMACS for preparing him to master the concept-based materials of his rigorous, freshman-year courses at Stanford.